[ADDIS ABABA] Universities across Africa must link up their agricultural research and teaching programmes to help modernise farming on the continent, a conference heard. 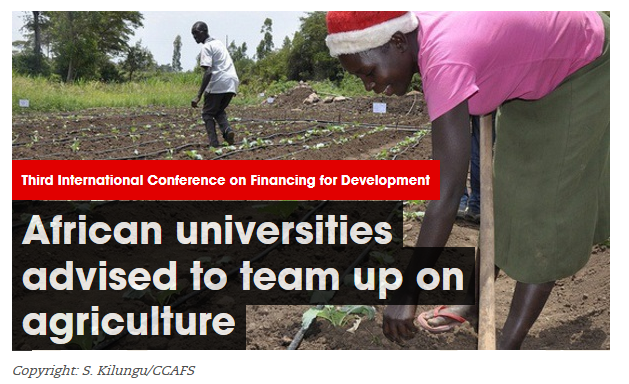 Speakers told the UN’s third Financing for Development conference in Ethiopia this week that universities should align their agricultural science efforts and collaborate with each other to compete internationally. Nkosazana Dlamini Zuma, the chair of the African Union Commission, said this would encourage young people to study agriculture and then to introduce better farming technologies. “The harmonisation of agricultural science is the first step in streamlining university courses so they attract more young people to science and technology,” she told delegates on 15 July. Dlamini Zuma and Ethiopia’s prime minister, Hailemariam Desalegn, were among panellists who discussed how African farmers are reluctant or too poor to adopt technologies and methods that could make agriculture more efficient. Another problem is that young people in Africa have little interest in studying agriculture at university because they see farming as a laborious, low-income profession, the audience heard. According to the UN’s Economic Commission for Africa (ECA), the continent imported 83 per cent of its food in 2013, despite more than half the population being smallholder farmers. Having a greater number of trained agricultural scientists would help increase yields for food grown in Africa, the meeting heard. Carlos Lopes, who runs the ECA, added that African farming could be an economic springboard. “We could use agriculture and mining to diversify our growth, and to support the budding service sector,” he said. The African Union’s Agenda 2063, a 50-year development plan for the continent, says widening the use of modern agricultural technology would help secure a steady food supply and improve farmers’ contribution to economic growth. But a lack of know-how, infrastructure and equipment make this goal difficult to achieve, said Donald Kaberuka, a former president of the African Development Bank. He warned that sustained national investment, in particular in transport and communication infrastructure, is needed to make sure that new agricultural scientists can implement the technologies they develop. “It’s always easy to find money for new things, but it’s hard to fund the maintenance of existing infrastructure,” he said. Reblogged this on The Farm Gate.